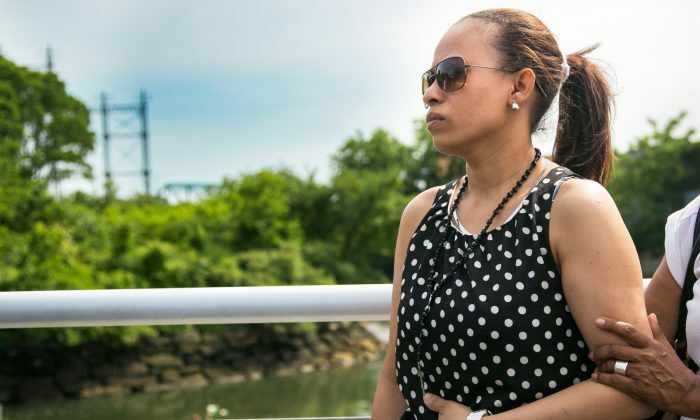 NEW YORK—On a hot afternoon on the last day of spring, a group of young teens played on the banks of the Bronx River, unaware that tragedy was about to strike. At about 3 p.m. last Friday, Wellington Gabin and Erikson Villa, both 13, were pulled out of the river, unconscious. Villa was pronounced dead upon arriving at a nearby hospital and Gabin died on Sunday. According to witnesses, both victims were part of a larger group of teenagers whom it is said decided to go for a swim. Starlight Park in the South Bronx near East 172nd Street, where the children were playing, is stuck in limbo amid a multimillion-dollar, two-phase upgrade that is only half completed. Only open in its current state since last year, it includes a basketball court, a riverside walking and biking path, a playground, and a soccer field. There are also two kayak docks on the water, where the children were playing. But according to area residents, there are no working bathrooms, no sprinklers, or water fountains. A bridge that should be next to the docks isn’t there yet. The sheer drop off along the bike path to the river and the still-growing interest in the park makes some residents nervous. Despite those shortcomings, after years of neglect, the community’s connection with the land and water there is coming alive again. According to 14-year-old Yasique Jordan, swimming in the river is a new trend with area youth. “Kids have only recently started swimming here,” said Jordan on Monday, who was also there last week when Gabin jumped in to help Villa when he was struggling to swim. Jordan said he himself swam in the river about a month ago. It’s a trend that the traumatized parents of Gabin and Villa want stopped. “We’re asking that a fence be put in this park from where it begins on the riverside,” said a tearful Robertson Villa, Erikson’s father, during a press conference Monday at the site where the boys drowned. He added that they also want the park to be closed until the fence is installed. Erikson’s mother was also emotional, crying as she echoed the plea. The families, both originally from the Dominican Republic where the boys were born, are also asking for financial support from the community to help with funeral expenses and the cost of sending them home to be buried. Starlight Park is part of the Bronx River Greenway, a 10-year, $150 million-dollar project that is intended to extend the entire 8-mile length of the Bronx. The project is a group venture of New York City and state and federal transportation departments. When finished, it will also connect to another 15 miles in Westchester County. The Greenway is a series of continuous parks and trails along the 23-mile Bronx River and is hailed as a “vehicle of transformation” by the Bronx River Alliance. The alliance states that the park is a critical link of the Greenway—a central connector for miles of trail and parkland to the north and south. Yet just at the spot where the boys drowned is where that very connector, a bridge, should be. The bridge would create an uninterrupted path along the Greenway, but construction stalled in 2009 due to lack of state funding. “What we don’t want is an unfinished product,” said New York State Assemblyman Marcos Crespo after the press conference on Monday. But Crespo, who represents the area that includes the park, said there’s no quick fix. “No one fence, no one law is going to prevent another tragedy,” he said. New York City has a long relationship with the waterfront. There is over 500 miles of coastline and the city is surrounded by waterways of all kinds. Yet despite that, the number of drowning deaths of children under the age of 18 is lower than the national average, according to the city’s Department of Health. In 2012, the last year the department had available data, there was a total of 17 deaths by drowning. Morty Berger, founder of NYC Swim, said that what happened to the boys in Starlight Park last week, though tragic, is not unheard of. Berger said that in bygone years, there was a better intrinsic sense among city residents of water safety. Around the turn of the 20th century, many New Yorkers used the waters to bathe, and volunteers patrolled the water’s edge much like a volunteer fire department. These days, city residents are more disconnected, and often lack basic knowledge of water safety. “There is no safe place to swim off the Manhattan shoreline, period,” said Berger, and added that rivers are more dangerous because the speeds of their currents vary. The Harlem, Bronx, and East rivers are technically not even rivers because they have currents running both ways with high and low tides. Roland Lewis, executive director of the Metropolitan Waterfront Alliance (MWA), agrees that the rhythm of the waterways used to be common knowledge. “There was a time when the average New Yorker knew about the tides and which way that the current was running,” said Lewis. Lewis and his organization, which represent a broad range of waterfront issues throughout the city, are in favor of creating more “get downs” into the water but also more “get outs,” like ladders. Though people have started using the water more for recreation, MWA advocates that basic knowledge about maritime life, swimming education, life preservers, ladders, and signs should be the norm. CORRECTION: An earlier version of this article incorrectly spelled the name of Erikson Villa. The correct spelling is Erikson Villa. Epoch Times regrets the error.